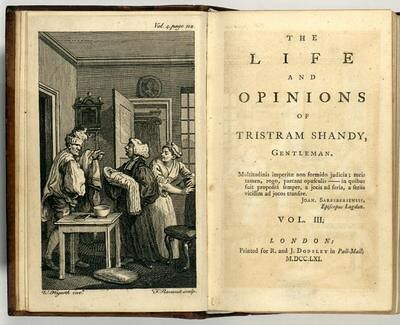 Our spring quarter starts tomorrow, so I’ve been spending some of my spring break planning my graduate seminar on Laurence Sterne’s The Life and Opinions of Tristram Shandy, which will meet on Thursday evenings starting this week. This is going to be a vert busy and difficult quarter for me, but I’m really looking forward to teaching this class. I anticipate that it’s going to be the most difficult class I’ve ever taught, but if I can pull it off it’s going to be immensely rewarding. I’ve taught Tristram Shandy twice before in my honors tutorial classes in 2008 and 2007. In both of these classes, we spent about two weeks rushing through the novel’s highlights. When I last taught it in 2008, I decided that I wanted to spend more time with this book, to challenge myself to really try to come to terms with it (emphasis on the word “try”). So, I decided that I would teach my next graduate seminar on it. What better way to force oneself to get to know a text better?! As a graduate student I was supposed to read Tristram for a seminar on the eighteenth-century novel. I didn’t enjoy the book at all and was never able to finish it. Now that I’m teaching it to graduate students, I’ve been trying to identify why I disliked it so. My current theory is two-fold. First, I think that the professor didn’t properly contextualize the novel for us. As a class on the novel, we read what one would expect (for the mid-nineties): Oronooko, Roxana, Pamela, Joseph Andrews, Memoirs of a Woman of Pleasure, and then Tristram, which was followed by Humphrey Clinker, Caleb Williams, and probably something by Mary Wollstonecraft or Jane Austen, but I forget now what we ended with. I now realize that this context only partially prepared us for Sterne’s novel, since the traditional of the eighteenth-century realist novel is only a small part of what Sterne is doing in Tristram. For this reason, I’m placing Tristram Shandy in a different contact by starting this seminar with Jonathan Swift. We’ll begin with Gulliver’s Travels and then read A Tale of a Tub (another text that I didn’t enjoy as a graduate student). I hope that these texts will show my students how Sterne is indebted to Swift’s combination of realism, fantasy, and satire. Like Swift, Sterne draw on the growing conventions of realist fiction in a playful way so that he can comment on and critique a host of cultural, political, and religious issues of his time. After our two weeks on Swift (the class meets once a week for 4 hours), we will further contextualize Tristram by spending a week on sermons. We’ll look at examples of the genre from Swift, Samuel Johnson, and Sterne. We’ll also read a few critical essays on sermons in the period, especially those by Sterne. In addition to introducing us to some of Sterne’s religious ideas, this week will give us further opportunity to talk about politics in the mid-century with a particular look at the evolution of Whig and Tory political positions. Then we’ll spend four weeks reading Tristram followed by a week on a recent movie adaptation. We’ll end with presentations on the students’ research projects. In addition to not having a better preparation in the generic context for Tristram Shandy, I also hypothesize that my professor in graduate school didn’t foreground criticism on the novel. Instead, that class emphasized theories of the novel more than individual critical readings of the texts we studied. While I was tempted to have my students read some theories of the eighteenth-century novel, I decided to dump that element and focus instead on criticism on Tristram. So, as we read the novel we’ll also be reading scholarship on it. I’m going to have my students each present a critical essay, so I’ve selected 13 articles/book chapters for us to read. Some of these are on Swift and the sermons, but a significant number of them are just on Tristram. We’ll be looking at Sterne’s indebtedness to John Locke’s An Essay Concerning Human Understanding (we’ll also read a short selection of this text). A couple of the essays we’ll read are about Sterne’s use of and position on the question of language. These essays look at the ways in which language in this novel is ambiguous and slippery, something in marked contrast to most realist fiction of the period, which seems to see language as much more determinate. And then another set of essays will look at issues of sexuality and gender in the novel. I’m hoping these essays will give us ways into the novel. In addition to presenting one of the critical essays, my students will be keeping a commonplace book, which is an assignment I like to have all of my eighteenth-century classes complete. They’ll also compose a conference-length research paper. This last assignment might well be the most difficult one for the class. I assume that it will be tough for most of them to define research topics on this novel. But I’ll also let they work on the sermons and comparisons/contrasts with Swift, so that will open up the topics a bit. When I moved out of the English Department and into the honors college last summer, there was some questioning of my teaching this graduate class by at least one of the department’s administrators, who suggested that the class be given to someone else. But I held on to it because I’ve been wanting to teach it for a couple of years now. Now that it’s here, I’m questioning the wisdom of teaching such a challenging class when I have so much work to do in the dean’s office. But I think it will be rewarding nevertheless. The next ten weeks might well be the busiest of my career thus far, but if I can survive them I should know a heck of a lot more about this masterpiece of eighteenth-century fiction than I ever thought I would. I’m not-so-secretly hoping that I will be inspired to write about Sterne in my current book project. If I haven’t figured out how he fits into it by the end of this quarter, then I assume I never will! We’ll see how it goes.